Today, nine people won’t come home as a result of distracted driving. More than 1,000 people will have been injured because they or someone else did not pay attention behind the wheel. We know that the proverbial truck can hit at any time and we cannot spend our lives worrying about all potential disasters. But we can make choices to limit the unnecessary risks we expose ourselves and others to. In 2016, a total of 3,450 people, including 562 outside of vehicles, such as pedestrians and bicyclists, died in traffic accidents linked to distracted driving. This is about 9% of all fatal crashes, according to statistics from the National Highway Traffic Safety Administration (NHTSA). 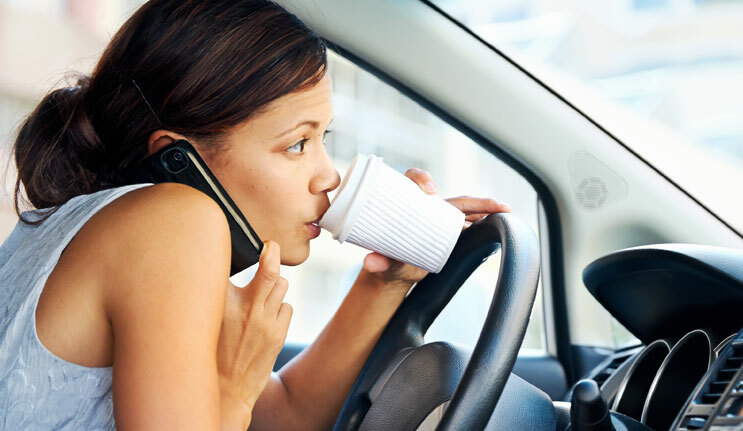 NHTSA and the National Safety Council (NSC) are using April as the month to raise awareness about distracted driving. One way to do so is by mobilizing law enforcement officers across the US to look out for drivers texting or using their phone behind the wheel through the ‘U Drive. U Text. U Pay.’ campaign. There are three main types of distractions. The manual distraction means you take one or both of your hands off the wheel, for example to grab a drink from the cup holder or help your kids fasten their seatbelts. The visual distraction implies taking your eyes off the road to look at an accident site or check your phone display to see who is calling. Finally, the cognitive distraction means taking your mind off driving. This happens when you daydream about a holiday or talk to someone using a hands-free device. All three take your attention away from what you are doing–driving–and places it elsewhere. As a result, this makes you less likely to notice a hazard, slows your reaction time and reduces your ability to avoid a crash. “But I know how to multitask,” you say. “I do it all the time.” Actually, you don’t. Multitasking is a myth. Our brains do not perform two tasks at the same time, they switch between tasks fast enough for us not to realize it is happening. However, one task is getting full focus and the other is placed on the back burner. Most people would agree driving should not be made secondary. This switching of attention from one thing to another is what makes you react more slowly if you are on your phone while driving. If one type of distraction is bad, imagine the result of combining all three, which is what you do when writing a text or updating your Facebook status behind the wheel. NHTSA estimates that sending or reading a text will on average take your eyes off the road for five seconds. Travelling at 55 mph, that means you have gone the length of an entire football field with your eyes closed. Another reason not to do this: Texting while driving is banned by law in 47 states. Distracted driving is a particularly important issue among young people. Of drivers aged 15 to 19 involved in fatal crashes, 9% were reported to have been distracted. The very young are also the drivers most likely to use handheld cell phones while behind the wheel. If we broaden the statistics and not only focus on fatal crashes, the figures are worrying. Almost half of high school students–42% nationwide, to be exact–reported having sent a text or email while driving, according to the 2015 National Youth Risk Behavior Surveillance Report. The answer is actually very simple. Keep your hands on the wheel, your eyes on the road and your mind on driving. In practice, it is of course more complicated. However, there are several things you can do already before starting the car. First off, make sure you get plenty of rest to avoid fatigue. Do your hair and makeup before you drive. Make sure your vehicle is well maintained so your focus is not stuck on how annoying it is when your windshield wipers leave a quarter of the glass untouched. Fasten your seatbelt and make sure your passengers are buckled up. Adjust your mirrors, radio and navigation system before you hit the road. If you need to send an email or make a phone call, do so before you put the key in the ignition, then put your phone away. Preferably in the trunk so it will not distract you during the ride. If you get hungry on the road, pull over for a snack break. Eating and drinking while maneuvering a three-ton vehicle is not a good idea. Anyone with children or pets (or children and pets) knows what a backseat crisis sounds like. No matter the urgency, it is better to pull over to mediate. Traffic and external events can also grab your attention. If something outside seems off, scan your surroundings, but keep your eyes on the road. Slow down when necessary. Leave enough space between yourself and the car in front of you–three seconds is generally considered suitable for a small car in good road and weather conditions–and try not to get annoyed with aggressive drivers. Even with your hands on the wheel and your eyes on the road, your mind may drift. This cognitive distraction can cause what is called “inattentional blindness,” which means that a driver can look at something without registering it. Maybe you can remember a feeling of waking up, when you realize the car in front of you has stopped without you noticing it. Another thing to do is to speak up. If the driver is going to make a phone call, offer to do it instead. End a conversation if you realize the person you are talking to is driving. If you are a parent, set a good example for your kids and talk to your teens about the dangers of distracted driving. There are also improvements, though we still have a long way to go. Tech companies are, for example, working on settings and apps that will help you to avoid the distractions of your phone. Apple, for example, has a “do not disturb” option which is automatically activated when the phone senses you are driving. It can, among other things, send an automatic reply to a person texting you, informing them that you are driving. Almost 500,000 passenger vehicles were driven by people using handheld cell phones at any given moment in 2016, according to estimates in the National Occupant Protection Use Survey (NOPUS). In percentage terms, this is 3.3% of drivers observed during the daytime at randomly selected roadway sites across the US. It remains a lot, but it is down from 6.2% in 2007. Less encouraging is NOPUS’ discovery that drivers visibly manipulating handheld devices, which includes texting, has increased significantly over the last decade from 0.4% in 2006 to 2.1% in 2016. The use of cell phone headsets has not changed much over the last 10 years and remains quite stable at 0.5% of drivers. Let’s stay with the hands-free devices for a moment. It is tempting to think that if you use a handsfree device, making a phone call is no problem, or that speaking on the phone is the same as talking to a passenger. Both are incorrect. Research shows that drivers talking on their cell phones make more errors than those talking to passengers. A passenger can act as a second set of eyes and ears and will adapt the conversation to the driving situation. When on the phone, you may feel you would be rude to pause what you’re saying due to traffic as the person on the other end of the line won’t understand why. Furthermore, the inattentional blindness we talked about earlier makes a driver talking on a handheld or hands-free cell phone fail to register up to half of the information in his or her driving environment. How about voice-command to send a text message or change music? Your hands and eyes stay where they should, and the action hardly takes any time at all. Here as well, research says it is better not to. It can actually take you up to 27 seconds to regain full attention after using your phone or car’s voice-command system, according to a study done at the University of Utah. If you travel at 25 mph, that means the equivalent of three football fields. Eva Nyman grew up in Finland, but has lived in Belgium, France and Hungary. She holds a degree in journalism and communication from the University of Helsinki and has worked as a reporter for ten years. She feeds her fascination with history and current affairs with books and her love of nature with hikes. She’s passionate about traveling, particularly slow journeys, and her dream is to visit every corner of the world. Do You Really Think Speeding Is Worth It?